Originally from Michigan, Dave Dolengowski has been involved with the game of golf for over 40 years. Dave began caddying and playing the game during his earlier years and participated in numerous junior tournaments in Michigan and Northern Ohio. Dave spent his high school summers employed at Lenawee Country Club in Michigan. In 1978, Dave enrolled in the acclaimed PGA Golf Management University Program at Ferris State University, where he learned all aspects of the golf business, while also completing internships at golf facilities in Arizona and Alabama, as well as at the prestigious Inverness Club in Toledo, Ohio. Following college, Dave pursued a professional career playing, competing in many PGA Section Championships and State Opens across the country. In 1985, he was elected to membership to The PGA of America, and is currently a Quarter Century Member. Upon concluding his playing career, Dave’s passion turned to teaching and coaching, and he started to learn from the best teachers by reading and collecting golf books. A student of the game, Dave credits some of the most accomplished teachers from over the years for helping to shape and influence his teaching philosophy. Dave has attended numerous PGA National Teaching and Coaching Summits and continues to pursue certifications to enhance his education as a teacher and coach. In 1997, Dave joined Marriott’s Grande Vista golf management team as a Senior Instructor, where he helps golfers of all skill levels reach their maximum potential. He also directs the team of Marriott Golf Academy certified instructors in working to maintain their high standards through ongoing training. In 1999, Dave was awarded the Ferris State University Bill Strausbaugh Award for Teacher of the Year. Today, Dave remains a strong proponent of using advanced technology in his teaching, including the V1 Pro Digital Video Analysis and Trackman, a golf radar for swing and ball flight analysis. During his tenure, Dave has worked closely with six-time Major Champion Sir Nick Faldo, along with many elite junior players, collegiate players and professionals, including LPGA star Se Ri Pak. He has also been a contributor to many industry publications, while his instruction tips have been seen on Golfweek.com and FoxSports.com, among other popular platforms. Dave enjoys spending time with his wife Ann, and their two children, Lucas and Maddie. A sports fanatic, you might find Dave at a Gators football or basketball game in his free time. Born in Charleston, West Virginia, David graduated from Glenville State College and The Golf Academy of the South, earning degrees in English literature and Professional Golf Management. A born educator, David was set to become a school teacher, but his passion for teaching golf led him down another path. Straight from the mind of a true educator, David considers himself "a teacher who teaches golf; not a golfer who happens to teach." David has been teaching at Marriott’s Grande Vista Resort since 1997, David is a mentor to many PGA Professionals and aspiring golf instructors who are seeking more knowledge about how to breakdown the golf swing. His fascination with studying and understanding how the brain functions has become a teaching asset that benefits both his students and his colleagues. His educational background was integral in helping to shape the Marriott Golf Academy instructional curriculum, ensuring each respective program, whether group or private, is tailored to each student’s skill level. David has worked with men and women of all levels from beginners to PGA TOUR players including Sir Nick Faldo. And, through his series of instructional videos, filmed and distributed on high profile platforms such as Golfweek.com and FoxSports.com, tens of thousands of golfers around the world have been inspired by his instructional tips, considerable knowledge of the game and teaching skills. David has also embraced today’s social media revolution and has played a major role in expanding Marriott Golf Academy’s global presence. In this capacity, he coordinates content distribution through a variety of social media channels including Facebook and Twitter. Additionally, he has been instrumental in the growth of the Marriott Golf Academy Alumni Clubhouse, an online resource center designed to support each student’s game improvement plan at their desired pace. An AimPoint certified instructor, David thrives on teaching students how to read greens and accurately predict break. Having spent considerable time studying how the brain functions, he incorporates the important mental approach into his teaching. He models his teaching style after some of the game’s greatest players such as Hogan, Snead, and Nelson, and his goal is to always help his students build their own swing and their confidence. Originally from New Jersey, Donald Moyer has been involved with the game of golf for over 25 years. Donald began his career as a caddie at the prestigious Ridgewood Country Club, host to the Ryder Cup, US Amateur, US Senior Open, and the Barclays. In 1996, Donald enrolled in the acclaimed Professional Golf Management Program at Ferris State University. Donald completed internships at the West Point Golf Club, home to the United States Military Academy, and Essex Fells, where he acquired his passion for teaching from his mentor, Russell Helwig, NJPGA Hall of Fame member. Donald also credits PGA Teacher of the Year, Harvey Penick, as a major influence to his teaching style and beliefs. Donald also is an accomplished player, placing in top 50 of the NCAA Division III Championship. 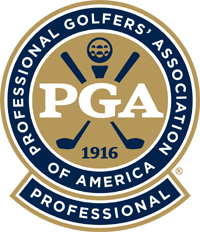 Following college, Donald was elected to membership to the PGA of America. In 2003, Donald joined Marriott’s Grande Vista Resort Team where he held positons as Assistant Golf Professional and Head Golf Professional. During his tenure, Donald continued his personal growth and education by completing the Marriott Golf Academy Instructor Certification Program and numerous management and customer service classes. One of Donald’s proudest accomplishments during his Marriott career is his spirit to serve fundraising efforts and initiatives for the Children’s Miracle Network. Donald’s other passion is to give back to our Ladies and Gentlemen in the Military. The son of a retired Coast Guard officer, Donald learned the values of honor, respect and dedication. Donald accepted the role as ambassador and lead instructor for the Marriott Golf Academy’s military initiatives, PGA Hope and On Course Foundation, which supports the recovery of wounded, injured, and sick service personnel and veterans through golf. When Donald is not on the lesson tee, you can find him enjoying the outdoors with his wife Heather and son Nickolas and serving as an adjunct golf professor at Valencia College. As her love for golf grew, in 2009 she entered the PGA Golf Management Program at Ferris State University to learn various aspects of the golf industry. Cori completed a six month internship at Wynstone Golf Club in Barrington, Illinois and a nine month internship at Faldo Golf Institute by Marriott in Orlando, Florida gaining valuable experience and developing an interest in teaching golf. After graduating from Ferris State University in 2013, Cori returned to Orlando to join the Grande Vista Golf Club & Marriott Golf Academy team. Also, in 2014 Cori became a certified TGA Premier Junior Golf Instructor teaching the history, rules and etiquette, and techniques of the game of golf to pre-kindergarten through eighth grade students in eight schools around Orange County, FL. Her goal was to leave a lasting positive memory for each student regardless of their level of play. With an increasingly strong desire to grow the game of golf, Cori began to focus on junior players. In 2015, she became US KIDS GOLF certified golf instructor and since then has captained the Marriott Golf Academy’s PGA Junior League team. She is also a certified PGA golf coach and will be coaching girls high school golf this fall. Cori’s goal with her students of all ages is to make sure they are enjoying their time on the course while working to improve and achieve their goals. Cori credits her mentor, PGA and Champions tour player Larry Ziegler. His wealth of knowledge, wisdom, sense of humor, and overall love for the game is infectious. Aside from teaching, Cori created Marriott’s Golf Experience program and has hosted numerous events, such as US Kids Golf Certification Seminar and PNC Girls Golf Skills Challenge. In 2015, she was awarded Marriott’s Grande Vista Star Performer. Originally from Niagara Falls, New York, Mike Ellis joined the Marriott Golf team in 2000 as Senior Golf Instructor at Marriott’s Shadow Ridge in Palm Desert, California. With over 30 years of experience at prestigious golf clubs throughout the country, Mike possesses a strong knowledge of the golf instructional business and has a passion for helping others achieve their goals. Mike finds gratitude in fostering positive relationships with his students—evident in the vast amount of students who return to him each year. A class ‘A’ PGA Member, Mike earned his bachelor’s degree in Marketing and Professional Golf Management from Ferris State University in Michigan. In addition to the extensive time spent coaching and instructing golfers of all ages and abilities, Mike’s vast knowledge and experience has been instrumental in the development and enhancement of the golf school curriculum at Marriott Golf Academy. His meticulous attention to detail as a Senior Golf Instructor is evident as Ellis is responsible for leading the staff and maintaining a team of excellence. Mike has worked closely with several accomplished players throughout his career, including Women’s British Open Champion and the #1 ranked LPGA player in the world in 2013, Yani Tseng. Additionally, he has been featured on The Golf Channel, Golfweek.com, FoxSports.com, and has been a special guest on several golf radio programs over the years, while having his work published in several industry publications. A huge sports fan, Ellis not only enjoys teaching the game, but is an avid player as well. Having spent most of his life in the Coachella Valley, Ben Nicholas is a California native with a passion for outdoor sports. A class ‘A’ PGA Member, Ben graduated from the College of the Desert with a degree in Liberal Studies. With great respect for the game, Ben joined Marriott’s Shadow Ridge in 2003 as Assistant Golf Professional. He soon developed a deep passion for helping golfers reach their full potential and decided to focus his energy on the instructional side of the golf business, where today he has become an accomplished teacher. In 2005, he also became a Certified Instructor at Shadow Ridge, which has helped to shape a very rewarding career teaching the game to others. While Ben works extensively with golfers of all ages and skill levels, he is especially passionate about junior golf. In fact, he is responsible for establishing a thriving junior summer program at Shadow Ridge that continues to grow annually. Drawing from his many years of teaching experience, Ben has appeared in several print and digital golf publications providing instructional tips and guidance to a diverse audience of golfers. When Ben is not teaching the game, he is also an accomplished player who has competed with great success in the Southern California PGA Section Championship for several years. In 2010, he earned a second place finish in the Desert Chapter Championship.